Amber Patterson watches Daphne Parrish in the gym everyday. Some might say she wants to be Daphne Parrish, or that she wants Daphne Parrish's life. Whilst both of those things may be true, Amber wants not to be Daphne Parrish, per see, but she definitely wants to be Mrs. Parrish. Amber wants Daphne's husband, Jackson Parrish, and she won't stop until she gets him. Amber is clever, comes across a sweet girl, perhaps a little naive. She ingrains herself into the Parrish's life quickly, becoming best friend and confidant to Daphne, and a welcome distraction for Jackson. With her sights firmly set on Jackson she goes out of her way to make him notice her, but so subtly that no one around them notices. Soon enough the pair are embarking on an affair, but Amber knows she must be careful if she is to truly ensnare Jackson in the tangled web she weaves. But Daphne Parrish is no fool, and she won't be taken by one for anybody. Amber may well have underestimated her rival, but is it too late for Daphne to save her marriage? And does she even want to? 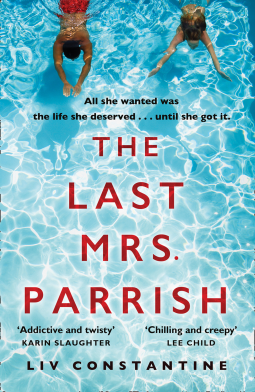 Split into Daphne's and Amber's perspectives, the last Mrs. Parrish is a novel that will have you taking a sharp intake of breath at a certain point, because no matter what you thought was going to happen... you will still be suprised! The Last Mrs. Parrish is available now via Amazon online and all good book shops.